Yep, it's another week of interesting links. First off, embrace YOUR CAPS TODAY! IT'S INTERNATIONAL CAPS LOCK DAY! You can now celebrate the 20th Anniversary of the fall of the Berlin Wall by tweeting #fotw. 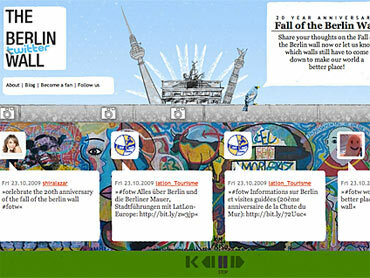 Your tweet, which can include your thoughts on the fall of that edifice - or any other walls that should come down - to "make our world a better place," will then appear on the interactive Berlin Twitter Wall site. 2) Who doesn't like free stuff? To celebrate the release of their upcoming album, This Is War, 30 Seconds To Mars is doing a cool giveaway, "30 Guitars in 30 Days." Until November 5th, all you have to do is go to this link to send a tweet and be entered to win one of 30 Michael Kelly Nostalgia Series guitars. In the midst of rehearsing in Los Angeles, the band's guitarist, Tomo, spoke to me about the giveaway, the new album and using social media to engage the band's fans. 4) As if calling out Taylor Swift and embarrassing himself in front of the world at the MTV Video Music Awards wasn't enough, Kanye West has decided to add some fuel to his fire. The rapper posted an odd and disturbing promo on his site this week. The video, directed by Where The Wild Things Are director Spike Jonze, was pulled from the site shortly thereafter. He obviously didn't act quickly enough. broke the story and now West is back as a trending topic-RIP Kanye West that is. Watch the video here.